You can draft and edit articles for a particular issue on your Newscoop server without any of the material being available to the public. You can then publish an entire issue all at once, and there are two ways to do it: immediately, or by scheduling the issue to be published at a specific date and time in the future. Note that within an issue, you can publish or unpublish each article individually; for instance, to hide an article even if the issue it belongs to has already been published. To publish an issue straight away, click the Publish link for the relevant issue and language edition in the Publish Date column of the Issue List. A pop-up dialog will ask you to confirm that you want to publish the issue in question, because this action implies that any articles which are set to Publish with issue (in the Status menu) will become available to the public instantly. See the chapter The sidebar for details. After clicking the OK button, the issue will be published, and the Issue List will be updated with the publication date and time of that particular issue. To reverse the process, click the Unpublish link. Again, a pop-up dialog will ask if you are sure you want to change the issue's status. To schedule an issue to be published automatically at a specific date and time in the future, click on the Schedule link for the issue and language edition you require in the Publish Date column of the Issue List. This will open the Change issue details page, where you can set the date and time for this particular issue to be published. Over on the right hand side of the page are the Issue Publishing Schedule and Schedule a new action boxes. 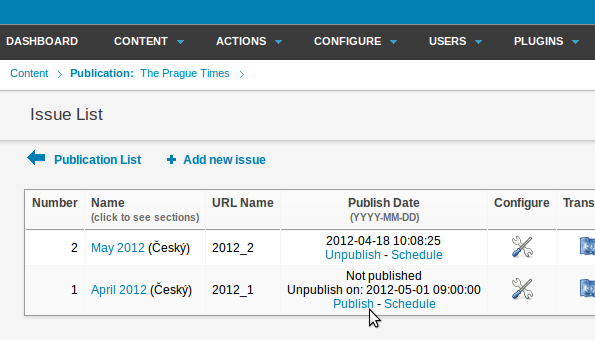 Click the small calendar icon to the right of the Date: field to select a specific day for publication. 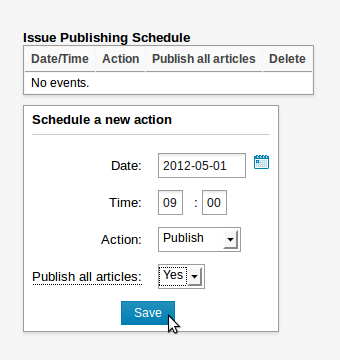 Set the time you require, and select either Publish or Unpublish from the drop-down Action menu. 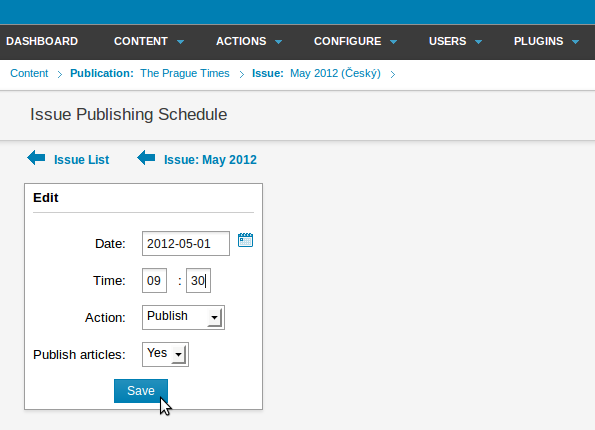 Set the Publish all articles: drop-down menu to Yes or No, depending on your requirements. Choosing Yes here means that articles which are part of the issue will be published, regardless of their copy status at the time. Then click the Save button. 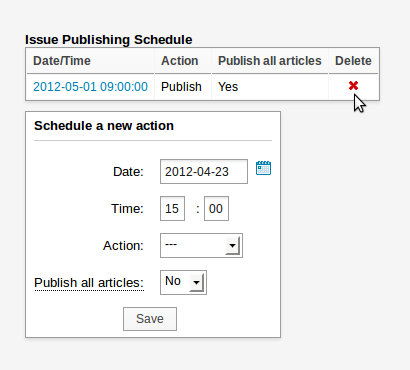 The Issue Publishing Schedule box will update to display the newly scheduled action. Note that you can also set the issue to be unpublished at a specific date and time in the future as well. This event will be displayed in the Issue Publishing Schedule box. To cancel a scheduled action, click the corresponding red x icon in the Delete column. You will be asked to confirm the deletion. If you click on the Date/Time link for a future event, the Issue Publishing Schedule page will open, and you will be able to edit the event. Click the Save button to confirm the schedule change.